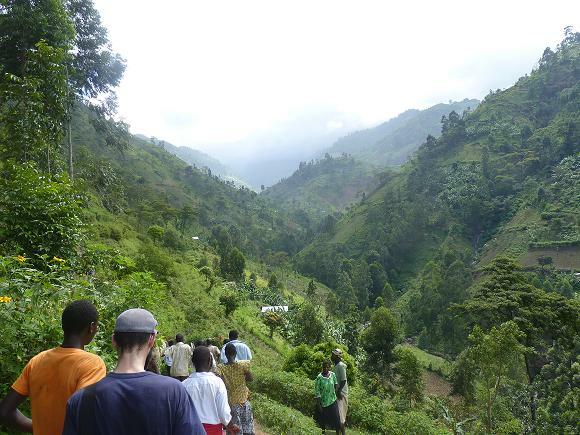 Tragedy during trip to Uganda | Small Farmers. Big Change. Hundreds of people hike to the site of the mudslides. My name is Thomas Lussier and I am the Lead Coffee Roaster at Equal Exchange. Last week Beth Ann Caspersen (Quality Control Manager) and I went to Uganda to visit the Gumutindo Co-operative. Since my years as a barista I have had a love for African coffees, so it was with great excitement that I prepared for this trip. Part of the trip was to include visiting a couple of primary societies and our farmer partners in the districts around Mt Elgon. When you visit producers, you expect to learn quite a bit. Perhaps it’s about how difficult it is to make a living as a farmer. Perhaps you’ll hear about climate change affecting weather patterns, growing seasons and rainy seasons. You might even learn about soil erosion. Working to change these things is part of the greater mission at Equal Exchange. 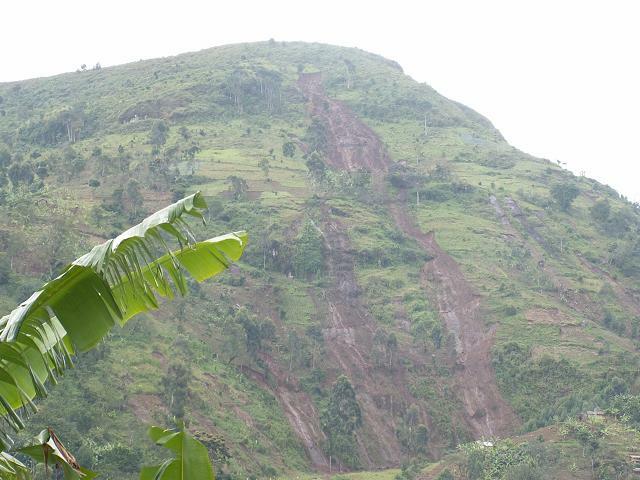 Some of the mudslides can be seen on the side of this mountain. What you don’t expect is a tragic mudslide to happen the very week you are there. You don’t expect to visit the slide area that buried a health clinic and a church, several villages, men, women and children. You don’t expect to attend the wake of the Chairman for the Savings and Credit Cooperative Organization (the SACCO is basically the farmers’ bank). It’s not unusual to witness hardship when visiting producers. During this trip, however, we witnessed utter tragedy and sadness. By the end of the week, there was reason to feel encouraged. Gumutindo is very engaged with its farmers. There are agronomists and field officers in the primary societies every day. They give trainings to the farmers about a wide range of ways to farm more sustainably. The trainings focus on everything from intercropping for sustenance and added income, to organic conversion, to techniques for increased soil fertility and avoiding erosion. 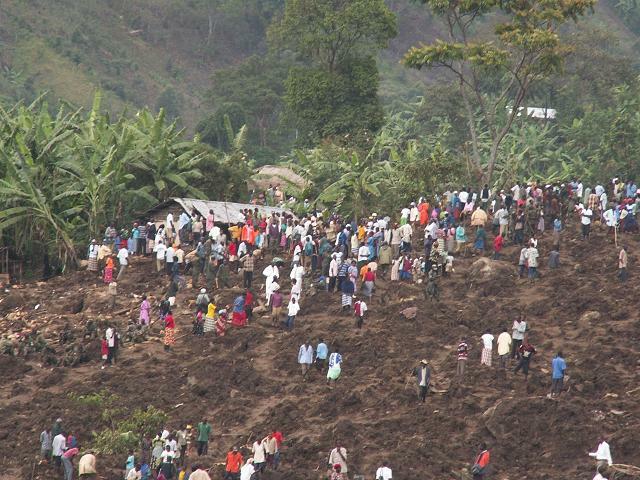 People gather at the site of one of the mudslides. There are still people missing beneath them. From what we are told, the trainings work. Farmers are receptive tothe ideas, and increased yields and higher quality coffee leads to increased incomes, savings accounts, and increased quality of life. Also understood is how better land stewardship will increase the quality of life for future generations. These are life and death incentives. I know that sounds dramatic, but soil conservation takes time and mudslides happen in an instant. This work needs to continue and be supported whole heartedly. My thoughts continue to be with the people affected by the mudslide in the Bududa District and particularly the societies of Bumayoga, Bukalasi, Nasufwa, and Buginyanya. That is horrible! I was fortunate enough to be able to participate in your facility tour in September as part of Expo East, and fell absolutely, madly in love with the coffee of Gumutindo (and order 5lb bags of it every few weeks). In my opinion, they produce some of the finest coffee that the world has to offer. I sincerely hope that the people are able to recover and that they soak up the knowledge provided to them to hopefully be able to prevent such a tragedy in the future. And thank you, Equal Exchange, for letting us know about the lives and goings-on of your farmers, good or bad. It’s wonderful to see how much you support your farmer partners, and as a consumer, it’s gratifying to know that much care was put into the products that I am fortunate enough to enjoy. and dying in the process. My name is Todd and I am the Director of Purchasing at EE. While I recognize that there may be illegal farming and logging on the mountain, I have confirmed with GCCE that none of the farmer members work in the national park; further the organic farming promoted by our farmer partners seeks to improve soil management on the mountain. In fact, most of the park is located at elevations unsuitable to coffee cultivation. We develop partnerships with cooperatives around the world that seek to create sustainable buffer zone around many national parks and bioshperes and this is an example of such an partnership. We believe supporting a sustainable economy for buffer zone communities is key to the long term preservation of wild spaces. I imagine it’s hard to face some of the realities you come across in your travels, but I never doubt that your very existence in the places the world brings you enriches everyone.